Unless you’ve been hiding under a rock, you’ve probably been bombarded with a million emails in your inbox mentioning the oh-so-magical time of year that merchandisers like to call “Festival Season”. To me, this is when the Spring season officially kicks off, and it starts in April with the Coachella music festival in the middle of the desert in sunny CA. Clothing stores and websites stock their shelves with cute, trendy, funky bohemian looks, geared towards this one purpose…aka festival style. And while the sun shines bright in the California desert this time of year (and let’s be real…all day, errry day, all year long), other parts of the country are still thawing out from a cold, snowy winter. And even in the best case scenario, there’s no more snow on the ground, but you’re fully enveloped in rainy, damp Springtime showers. So, how do we wear this festival style that’s meant for the desert while still remaining warm and cozy? 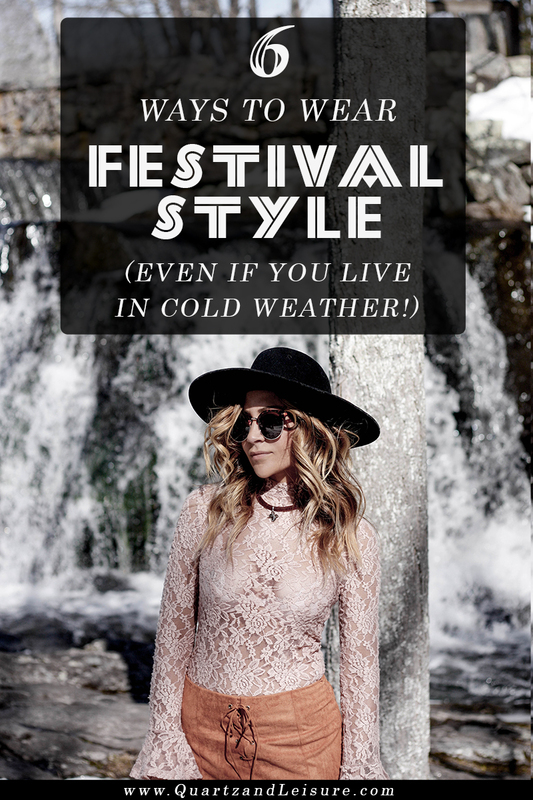 Follow my tips below for how to manage the perfect boho festival style in cold weather. A hot trend this year and a total must have for any boho look. Plus, the long sleeves will keep your arms warm. And, as an added bonus, they’ll hide the fact that your arms haven’t seen a single ray of sun in 6+ months. Now, please pass the self-tanner! Click here to see all my favorite bell sleeve picks for this season. These two are always a colorful way to add a fun element to any look. 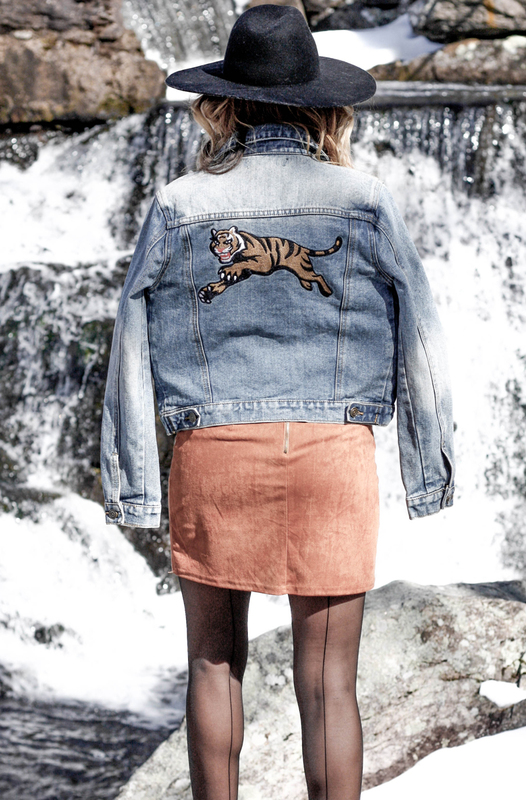 Patches are definitely hot right now, and can be added pretty much anywhere! Think: your purse, your shoes, your t-shirt, even your jeans. 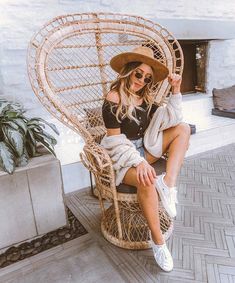 While these materials are usually too warm for the sweltering desert temps, all of us lucky/unlucky ones in the rest of the country can rock them freely without having to worry about passing out from the heat. 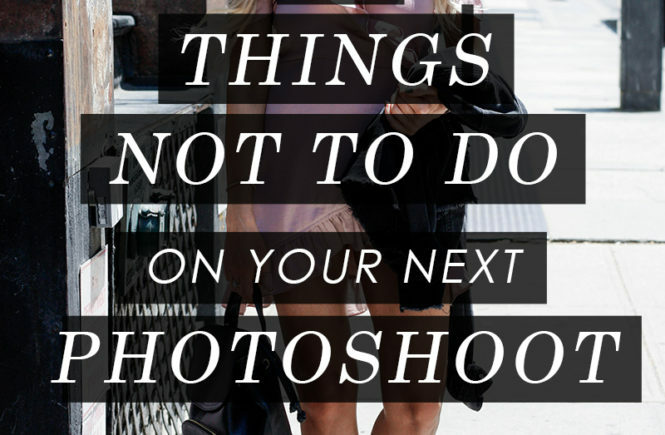 My faves are a leather or suede moto jacket, and this faux suede lace up skirt that I’m wearing in these pictures. While all the cool girls at Coachella will be rocking denim cutoffs, it’s still a bit chilly here to be wearing short shorts. Unless, that is, you can pair them with some tights underneath to keep your legs warm! Patterned tights (especially fishnets) have been making a comeback and look great layered under any kind of denim. If you need a few tips on how to rock tights with jeans, click here to read my previous post! To me, lace always comes across as romantic and airy, and lends perfectly to the bohemian style we’re trying to achieve. 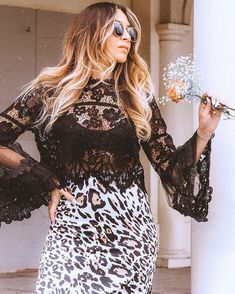 You can wear a lace top or dress by itself, or try layering a tight long sleeve lace shirt underneath a rocker tee to provide an extra layer of warmth as well as an extra layer of style. This actually remains sort of the same no matter what climate you live in. Because accessories always make the outfit! For festival style, I always like to pair a funky hat, a bandana scarf, and some eclectic bohemian jewelry (statement rings are my fave!). So, are you going to Coachella this year? And what are you planning on wearing once you get there? Give me allll the outfit deets in the comments section below!